As a non tech guy I've got a related question. Can you just connect these devices with a cable? Blue tooth uses a bit of power in both devices, so turning it off should save some juice. Do you have to keep your phone paired with the InReach while you use the app? Seems like two battery drains instead of one? What's the runtime on that? Yes...the phone must remain paired, but you can actually use the app and not even have the inReach turned on...you just need your location ability turned on in the settings of your phone. I just used that function to track progress over 12 hours of driving across Peru. Works perfectly. The only thing you can't do when using it this way is send messages from the inReach. A 100% charge on the inReach will last 100 continuous hours or more. No...they cannot be connected via cable, but the inReach can be used to full-function as a stand-alone unit. The Earthmate app can also be operated on the phone without having the inReach turned on, but not all functionality is available that way. OK, have read thru this and am very interested. For an iphone7, is Backcountry Navigator Pro the app to get, or is there another newer better one? How long does it take to become proficient with one of these apps? Anything else to help start me down this path? Just my own humble opinion, but I would not recommend relying on your iPhone (or any smartphone) as your navigation tool. I've had students in the courses I teach in try to do that, and it will blaze through power levels in no time. Even when I do use the Earthmate app with the inReach, I am just sending or receiving a message via the Iridium connectivity, or I am marking a waypoint of some significance. Otherwise, I am using my compass, map (old school paper type), and occasionally checking a small Garmin Foretrex 401 hanging in my Kit Bag. Not saying you are expecting to navigate solely on the phone app, but just in case you had thought that was what I was doing with it. Appreciate the input, alpendrms. No, I would not rely on my iPhone for navigating. I don't even own a GPS. With my compass I don't do anything fancier than plain old dead-reckoning. I would however like to have an app on my phone that would allow me to access maps and plan trips from the comfort of my home. Also, having such an app would allow me to know firsthand what others are talking about tech wise so I can intelligently contribute to the conversations. Like any other tool, you have to understand a smartphone's pluses and minuses. What it is is the extremely high image quality base mapping GPS that you already own. And e-reader. And camera. And medical reference. And clinometer. And, and, and. What it isn't is physically robust and battery efficient. The robustness is easily addressed with the right case. The battery issue isn't too hard to work around. Following my advice in this thread, you should get 4-5 days of normal backcountry use on a single charge. That being said, I still don't 100% rely on a smartphone for critical functions. There's a level of complexity with a mini-computer that I inherently distrust. I carry a foretrex GPS that I haven't pulled out in a few years now other than to replace the batteries, and a compass that I basically never have a use for. Kevhans, you really should invest in a foretrex and learn to use one of the grid systems (UTM or Lat/Long) to precisely position yourself on a map. You can actually learn using your smartphone before buying a foretrex, you just need to ignore the base map display and use the coordinates. GPS plus a grid system gives you the ability to position yourself on a map in a way that a compass never could. Positioning yourself with a compass requires you to be able to identify features in the landscape. If you can do that, you pretty much don't need the compass anyway. 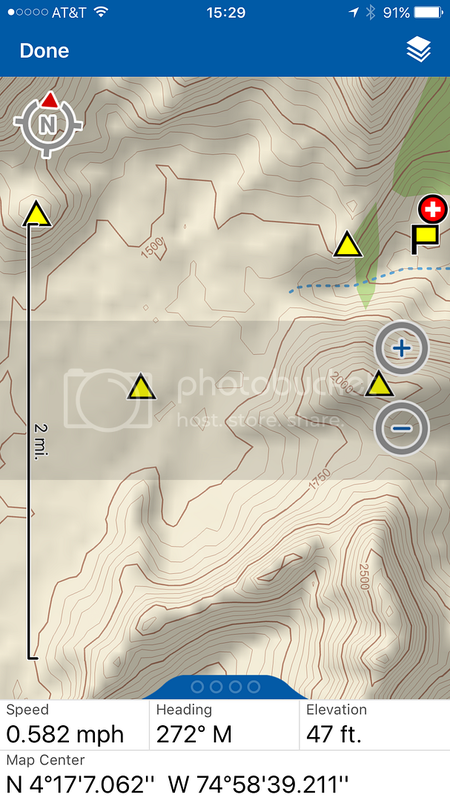 GPS lets you position yourself when you can't identify a single feature in the landscape. Extremely useful. To answer your specific question, I'm not an iphone user so I don't know what app to recommend. Since I've figured out that the DeLorme stuff is vector based, not raster based, I'm now a big fan of that even though it costs some money (it's free with an InReach subscription). It is a very efficient way to store map data. I've got most of the western US stored on my phone in only a handful of gigs. And the vector based data is infinitely zoomable. It wierds me out sometimes, but you can zoom in to the point that the contour lines are off of the screen. I've found that useful when trying to trace out old out of use trails. They're not always the best way to travel through the country but sometimes they follow the only navigable route through an otherwise impassable landscape feature. In my job, we often use the Avenza Maps app. It's a good tool for planning, and doesn't require the internet to access a map once you've downloaded one. USGS and several other maps are available sources. They are downloaded as PDFs. Might be a good option for you. 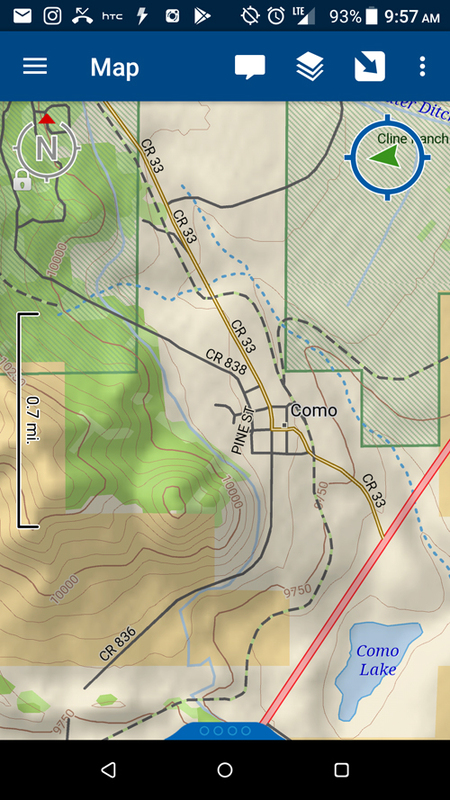 Here's a screen shot of a USGS map for Como, Colorado using the Avenza Maps app. I downloaded it for the HPG Winter Skills event. The app will allow you to zoom in, place pins for waypoints or areas of interest, etc. As you move the cursor on the map, the Lat-Long coordinates are displayed at the bottom of the screen. You can also set up the coordinate format for UTM or MGRS / USNG. Photos can be plotted, and coordinates can be found if input to the app. Thanks, Evan and alpendrms. I've got some homework ahead of me. This is getting pretty far down the rabbit hole, but I find it interesting -- different map data sources have very different information. USGS data is usually the most out of date with respect to trails and vegetation. Lots of recognized trails exist that aren't on USGS quads. On the other hand, you can find old unused trails on USGS quads and attempt to follow them. But woe be to you if you are expecting a trail on a USGS quad to actually be there. It very well may not be. USGS quads have lots of man made structures and features that aren't on any other data sources which can be very cool. The DeLorme data seems to be the most up to date with respect to trails. Often times I'll find trails on the ground that are also on the DeLorme data that aren't on any other map I have. The mountainous areas of the western US in USGS 1:24k format used to take up 30 gigs on my phone. Now I've got the entire western US all the way down to the most specific resolution on my phone in only 10 gigs using DeLorme data. As a guy raised on USGS quads, I miss them a lot but I'm getting re-adjusted to other data sets. So true! That is exactly why we teach students in our courses to not depend on a single map...but to always check other sources of mapping data. You should see some of the accuracy deviances we run into overseas! The maps we initially used in Mazamari, Peru had a datum of South American Provisional 1956! Although an obscure datum, it was actually listed in our GPS set-up menu. That's really important if one intends to successfully navigate point-to-point using features and topography identified on such an old map. Couple that with determining the current magnetic declination for the area....good to go! Evan's photo above shows exactly why my go-to device is the DeLorme (now Garmin) inReach Explorer. The Earthmate app (a free download that comes with the inReach), pairs the the inReach with your smartphone via Bluetooth and makes use of very up-to-date data. Iridium satellite tech enables use of it globally. The inReach has proven itself to me several times over. Here's another screen shot, from my Earthmate app, which comes as part of the DeLorme (Garmin) inReach Explorer package. This is the site of where my jungle base camp and navigation course will be set up in Colombia for training I will be conducting in August. Bottom line, the DeLorme (Garmin) inReach system and Earthmate app are pretty dang accurate and user friendly for many adventures. Yes, it is a spendy option over others....but a great deal more can be done with it. So dredging up an older thread I have been looking into using my iPhone 7 plus as my back country device. I have read, for the most part, through the posts in this thread. I realize Evan that you are referring to an android device. I myself prefer the apple OS for simplicity but that is neither here not there. So disregard the OS issues, I've come across an app called Gaia GPS. So far I like it, you have access to a lot of maps (in pro) to include NatGeo Illustrated maps. This is a yearly subscription thing and I'm running on a free trial. I noticed in the posts above you mention the the "Base Maps" and the USGS maps are not to great. Could someone elaborate on this. The Topos on this app include USGS maps as the base maps. So should I avoid these or...? You can overlay Sat images onto Topo maps and the such. It has a lot of bells and whistles but seems pretty solid so far. This is my first go at using a phone based back country device though so wondering if anyone has any experience with this app. Just for reference the free version is inherently useless in the back country, you can not download maps or print maps. So no signal = no good. 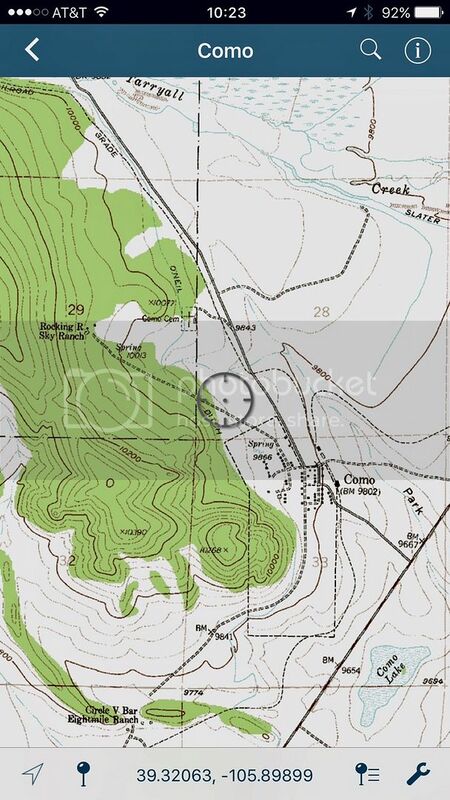 USGS topos are awesome for the information presented. The issue is that the way they are stored takes up a lot more space than the delorme vector based images. If you're trying to store several states on your phone like I am, it makes a difference. As phone storage capacity keeps climbing, this becomes less and less of an issue.